At the turn of the millennium, the reimagining of Alec Issigonis’ archetypal Mini as its own brand, a brand ready for the world’s most demanding automotive market, was a resounding success. Mini’s parent company, BMW, tapped into the counterculture that was forming in protest of the gas-slurping leviathans trundling along America’s highways. It was the “anti-SUV.” But it was more than just a small economy car. It was fashionable, cheerful, and even cute. People with the means to buy larger and more expensive cars were buying Mini Coopers not just to cut their fuel bills down, but because they were cool. It was a small car you wanted to be seen in. On top of that, the Cooper S was a high performance, forced-induction hot hatch version of the Mini that could breathe down the necks of much more powerful sports cars simply by virtue of its light weight and short wheelbase, especially when the road got curvy. But hype is short-lived and times change. Mini couldn’t survive on just one model, especially when the equally retro and trendy Fiat 500 arrived in 2012. So they added everything from a low-roof coupe version (which ultimately didn’t survive) to, ironically, a small SUV called the Countryman to the lineup in order to stay relevant. Amidst all these changes in Mini’s philosophy, the question arises: does the flagship Mini Cooper Hardtop still have the same fun and chic, yet slightly rebellious image it did nearly two decades ago? My test car, for example, had something never conceived in the era of the original Mini: four doors. Looking at it head on or from the back, it looks identical to the 3rd generation Hardtop that arrived in 2014. 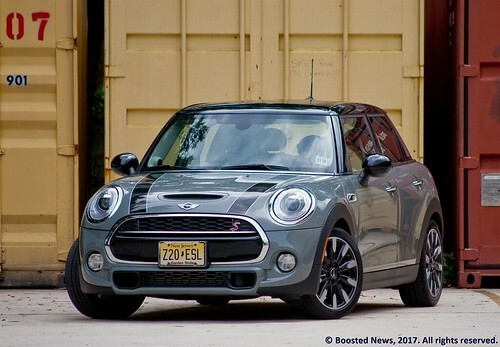 But, from the side, the Mini’s shape has been elongated and the rear passengers now have just as much ease of ingress and egress as the front passengers, as well as considerably more legroom. So it’s now exactly the same length and slightly taller than a Golf GTI, which, you’ll note, does not have Mini anywhere in its name. 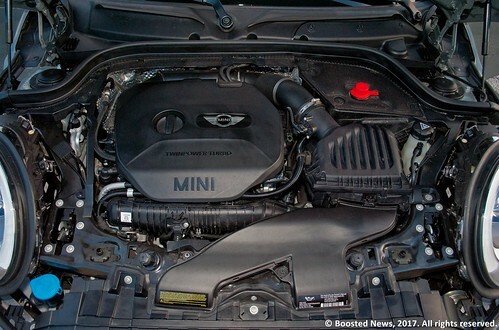 The powerplant for the Cooper S has changed as well. Initially powered by a supercharged Tritec engine (co-developed by the now belly-up Rover Group and Chrysler) and then by a turbocharged Prince engine (shared with Peugeot and Citroën), the execs in Munich decided the 2.0L TwinPower turbocharged, intercooled, and direct-injected 4cyl being churned out for cars like the 3-series and 5-series would be the ideal engine for the latest Cooper S. It makes 189hp and 207 ft-lbs of torque, both improved over the Cooper S’s previous engines. 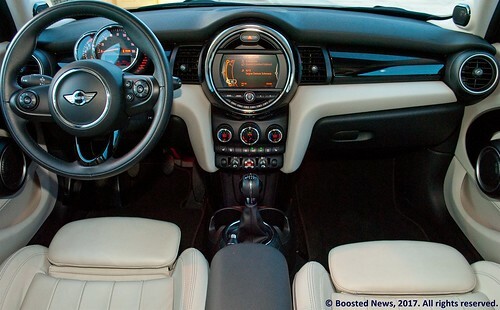 Much to my beaming delight, my Cooper S tester was equipped with a six-speed Getrag manual transmission. An automatic with paddle shifters is available, and a dual-clutch transmission is on its way. But don’t kid yourself; you really want the manual. It’s wonderful to operate, with just the right amount of throw in the shifter linkage and a clutch with spot-on weight and engagement. The engine will also rev-match for you when you downshift into any gear above 2nd. The 0-60 time of 7.3 seconds and the quarter mile time of 15.5 seconds at 92mph were achieved under damp testing conditions, and should be around half a second faster with more traction. The “TwinPower” part of the engine’s name means the turbocharger is a twin-scroll unit, designed no doubt with the torque-craving American driver in mind. It’s apparent that small, twin-scroll turbos are making the absence of boost at low speeds a thing of the past, with the TwinPower’s torque peak available just above idle. The trade-off is that the engine loses a considerable amount of punch in the higher rev ranges, and while the acceleration times are respectable, they don’t match the figures of the more powerful BMWs to which the Cooper S’s engine can trace its roots. That’s not the Mini’s calling, however. Even in Cooper S guise, a Mini is supposed to feel ambitious yet lissome, impatiently excited to get going but with deliberate focus, never brute force. 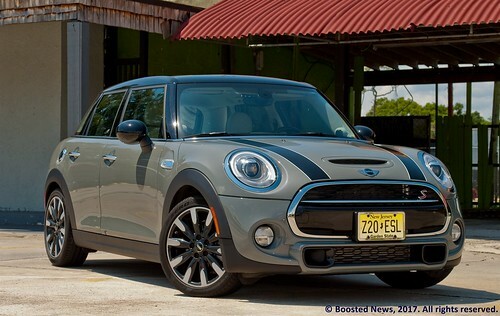 The engine’s torque definitely gives the Cooper S the feeling of ambition, and the curb weight of 2,895lbs proves that Mini still realizes the importance of lightness in how a car feels and drives. However, the rear suspension, while independent, consists of trailing arms, a design that’s becoming a bit old-hat. The Cooper S’s handling is good because of the low weight and the Pirelli P Zero rubber, but the 0.85g of lateral acceleration suggests it could be better. 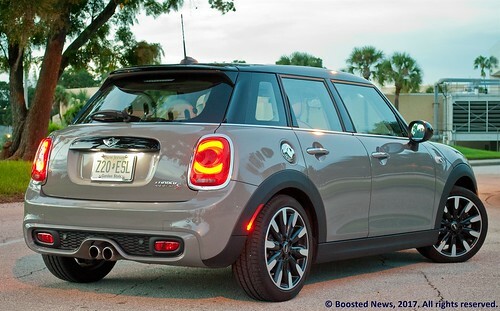 The Cooper S has Electronic Differential Lock Control, which is what Mini calls brake-based torque vectoring. It keeps understeer pretty well at bay and helps manage wheelspin when exiting a corner. But it’s not a true limited-slip differential, and the whole car would feel crisper with a proper multilink arrangement in the rear. Furthermore, there isn’t an upside in livability either, as the Cooper S’s ride is on the harsh side. Even the expansion gaps in a stretch of concrete interstate will make you aware of every transition between slabs by feel, not just by sound. The dashboard retains the prominent, almost overbearing circular display in the center that was the speedometer back in the 2000s. It’s now the nav/stereo display and the gauges have moved to the more traditional placement atop the steering column. The engine start button joins the auto start-stop deactivation button and traction control off button on the bottom of the dash ahead of the shifter, where they look like aircraft-style toggle switches. The interior is quite stylish compared to its rivals. But, alas, there are issues. The Cooper S has controls equivalent to BMW’s iDrive behind the shifter and to the right of the handbrake, meaning the handbrake is often in the way if the driver is trying to use them. But one design faux pas with the handbrake left me aghast at its oversight. The center armrest between the two front seats is height adjustable, and for me, the armrest’s only comfortable position is all the way down. The handbrake handle will collide with the armrest if it’s in that position and move it up several notches, unless your arm is still on the armrest, in which case you will not be able to engage the handbrake at all. Again, Mini’s parent company is BMW, and I would expect more forethought from one of the world’s most well-known luxury automakers. Finally, there is one other big problem: the price. As-tested MSRP is a few hundred dollars shy of $35,000. 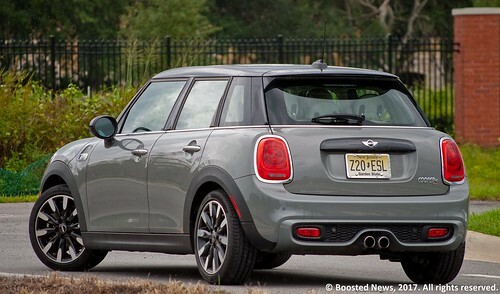 The Cooper S is a hot hatch, and that means it has some pretty fierce competition. The crux of the matter is that cars like the Golf GTI are available with more power and more torque, better handling, better ergonomics, and more practicality for several thousand dollars less. To answer my own earlier question about whether the Mini Cooper S still has the same edge it had seventeen years ago, the answer is, unfortunately, no. It is certainly still fun to drive, and if you still find that retro look appealing, the good news is they haven’t changed it very much. But as a hot hatch, it has been objectively surpassed by just about everyone else, and it doesn’t look like it’s trying very hard to catch up. What’s more, judging by the price Mini is asking for it, it doesn’t look like they even realize it needs to catch up. Test vehicle provided by BMW of North America.